ERCIS, Turkey - Murat Sonmez's mother, wife and four daughters were crushed to death in their home by Turkey's 7.2-magnitude earthquake, leaving him so distraught he found it difficult to speak. While media coverage has centered on tales of against-the-odds rescues including a 2-week-old baby girl who was pulled alive from the rubble, most stories of the trapped have ended the way that Sonmez knows, with death and unfathomable pain for those left behind. "I was not at home," Sonmez said, lapsing into silence at times Wednesday. "God gave them, God took them away. I can't find anything to say. "I can't describe my pain," he said as he stood by a leveled four-story apartment building. 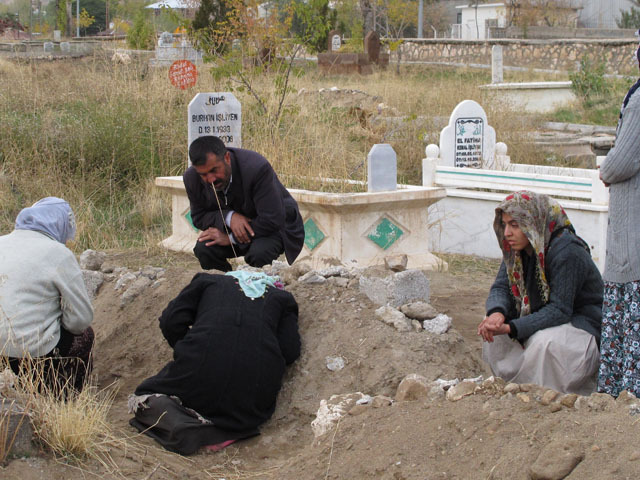 He listed the dead: 32-year-old wife Meral, four daughters  2-year-old Nisa Nur, 7-year-old Meryem, 12-year-old Asli and 15-year-old Meral  and his 65-year-old mother, Hatice. They lived on the second floor, above some businesses. The third and fourth floors were occupied by Sonmez's brother and father, who managed to escape. He said he and relatives pulled out their dead and buried them, just a few of the victims of the quake that struck eastern Turkey on Sunday, killing at least 461 people. Elsewhere in Ercis, the town hit hardest by the quake, two teachers and a university student were rescued from ruined buildings on Wednesday, but searchers said hopes of finding anyone else alive were rapidly fading. NTV television said 25-year-old teacher Seniye Erdem was pulled out around the same time that rescue workers also freed another teacher. The woman was thirsty and asked about her husband, who had died, it said. Excavators with heavy equipment began clearing debris from some collapsed buildings in Ercis after searchers removed bodies and determined there were no other survivors. More than 1,350 people were injured. Gozde Bahar, a 27-year-old English teacher, was pulled out of a ruined building on Wednesday with injuries as her tearful mother watched anxiously. The Anatolia news agency said her heart stopped at a field hospital but doctors managed to revive her. Earlier in the day, rescuers pulled out 18-year old university student Eyup Erdem, using tiny cameras mounted on sticks to locate him. They broke into applause as he emerged from the wreckage. Olcay Kotiloglu, a miner, was one of the first rescuers to respond to Erdem, whose ankle was stuck under a big column and who was shouting for help. "He first asked: 'Brother, will you be able to take me out?" Kotiloglu said. "He said his leg was stuck and it was dark." Erdem, however, showed signs of losing consciousness as well as patience as the hours passed. "At one point, he kept asking: 'When will I get out, you always say half an hour. When?"' the miner said. "But he helped us a lot when we asked about his position." As he was taken to an ambulance on a stretcher, Eyup exclaimed to his rescuers: "Thank God for you!" Prime Minister Recep Tayyip Erdogan said 63 teachers were among the dead and he alleged that shoddy construction contributed to the high casualty toll. He compared the alleged negligence of some officials and builders to murder because they ignored safety standards. "Despite all previous disasters, we see that the appeals were not heeded," Erdogan said. Sonmez, the man who lost his family, said the building where they lived was 25 years old. "We had it built on our own, the technology was not as good as today in the past. But even if it had been built better, it probably could not have withstood the temblor," said Sonmez, who is in his 40s. "It was so powerful." Mattresses, pieces of clothing and plastic red and yellow flowers were mixed with twisted metal and chunks of bricks and concrete. A small heart-shaped red pillow, bearing the words "I love you" was seen at the edge of the rubble. A green potted plant stood on the debris. Erdogan acknowledged problems in sending aid for thousands of people who were left homeless, but said close to 20,000 tents have since been sent to the quake zone. Turkey has said it will accept prefabricated homes and containers from other countries to house survivors, many of whom have slept in the open in near-freezing temperatures for three nights. "There was a failure in the first 24 hours, but in such situations such shortcomings are normal," Erdogan said. "There may not be sufficient equipment in depots at the start, but these have (now) been resolved with equipment from other depots." The quake destroyed one school and Turkish engineers were making sure other schools were safe or rendering them fit to resume lessons. About 800 students at that school in Ercis were probably saved because the quake hit on a Sunday. Hundreds of angry people in Ercis and nearby villages on Wednesday protested what they say was a lack of coordination of aid distribution outside the office of the local governor, complaining that they were not able to receive tents yet. A senior police official with a loudspeaker tried to calm the crowd as dozens of Turkish soldiers and policemen blocked entrances of the governor's office. The head of the Turkish Red Crescent organization, Ahmet Lutfi Akar, said 17 trucks were looted before aid could be distributed. Health officials said they had detected an increase in diarrhea, especially among the children, and urged survivors to drink bottled water until authorities can determine whether the tap water may be contaminated. With thousands left homeless or too afraid to return to damaged houses, Turkey said it would accept international aid offers, even from Israel, with which it has had strained relations. Israel offered assistance despite a rift between the two countries over last year's Israeli raid on a Gaza-bound flotilla that killed eight Turkish activists and a Turkish-American one. Turkey expelled top Israeli diplomats and cut military ties, saying relations won't normalize until Israel apologizes for the raids and compensates victims' families. Israel insists its soldiers acted in self-defense during the raid. Israeli Defense Minister Ehud Barak ordered a team to supply aid for Turkey "within minutes" of hearing the request for emergency housing units, an Israeli Defense Ministry spokesman said. A first set was scheduled to arrive in Turkey on Wednesday evening while more would be sent by sea. Foreign Minister Ahmet Davutoglu, speaking at a news conference during a visit to Jordan Wednesday, said the Israeli assistance would not change Turkey's "principled position" toward the country. "Our political conditions continue," Anatolia quoted him as saying. Over 500 aftershocks have rattled the area. On Wednesday, authorities in the city of Van, 55 miles (90 kilometers) south of Ercis, transferred about 350 prison inmates to jails in other cities after prisoners, demanding to be let out after an aftershock Tuesday, set bedding on fire inside the city's 1,000-bed prison. The region is mostly-Kurdish populated and an area where Kurdish rebels are waging an armed campaign for autonomy from Turkey. The conflict, which has killed tens of thousands since 1984, continued despite the quake. Suspected Kurdish rebels detonated a roadside bomb as a military vehicle drove by 50 miles (80 kilometers) from Van on Monday. Four soldiers were injured, it said.